3-piece wall-mounted acoustic panel that opens to create a vocal booth or provide acoustic absorption. 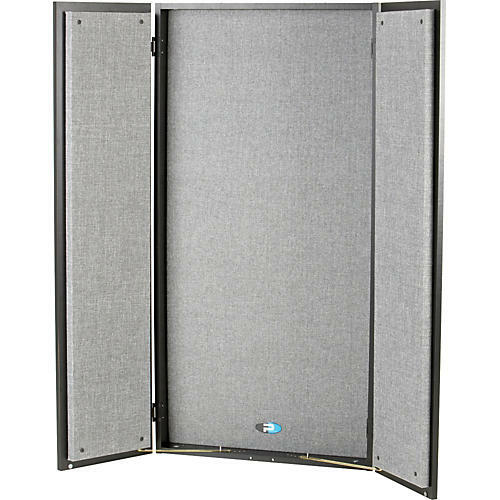 The Primacoustic FlexiBooth is a full size 24" x 48" wall-mounted acoustic cupboard that opens up to surround the voice talent and create a 16 cubic foot voice-over zone. This eliminates room ambiance from the voice, thus allowing the engineer to add the required echo or reverb to best suit the performance in postproduction. From the outside, the FlexiBooth looks like a typical cupboard. It features an attractive black melamine finish that is easy to clean. Inside, ultra high performance 6lb per cubic foot fiberglass panels effectively absorb sound throughout the voice range. The acoustic panels are 100% encapsulated with micromesh and are covered in a tough yet attractive acoustically transparent fabric to enhance the fit and finish. The FlexiBooth performs double duty as a variable room ambiance device. Those that have recorded in large professional studios will be familiar with the variable acoustic panels that are often used to tailor the room acoustics. For instance, a brighter more ambient room is as generally preferred with acoustic instruments or darker ambiance for voice, electric guitars and so on. By positioning several FlexiBooths around the room, one can easily create different acoustic environments by simply opening or closing the FlexiBooth doors. To reduce freight costs, the FlexiBooth ships flat and assembles in minutes using common household tools. The Primacoustic FlexiBooth provides a simple yet highly effective solution for vocal recording that can adapt to any room. Comes in black/gray or black/beige.